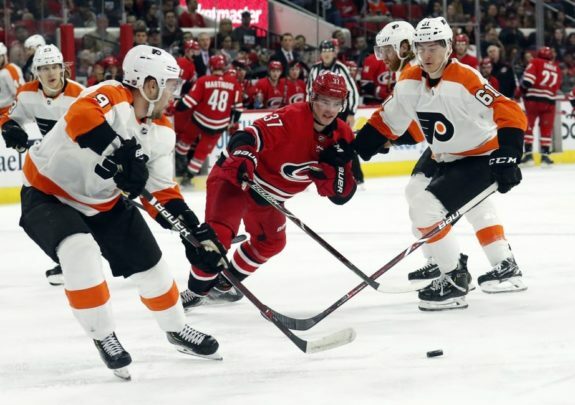 They got off to a good start against Carolina, though, as Giroux opened the scoring with 7:55 remaining in the first period off a pass from Corbin Knight on a 2-on-1 break. It was Giroux’s 21st goal of the season, breaking a 10-game goal-scoring drought. The Hurricanes struck back quickly. Teravainen scored Carolina’s first power-play goal in 10 games with 6:25 remaining in the period when he converted a rebound after a Justin Williams powered to the net and tried to jam in a shot from the goalmouth. Another rebound goal put the Hurricanes ahead 2-1 as the puck pinballed to Hamilton for an easy shot into the short side of the net. It was Carolina’s quickest two-goal spurt since Williams and Micheal Ferland scored 8 seconds apart on Nov. 18 in a 2-1 win over New Jersey. Justin Faulk’s power-play goal with 8:03 left in the third period increased Carolina’s lead to 3-1, but Lindblom responded with a goal with the man advantage 1:15 later. Empty-net goals by Jaccob Slavin and Brock McGinn clinched the win. NOTES: Teravainen’s goal gave him 20 for the season, marking the first time since 2009-10 that more than three players have scored at least 20 goals for the Hurricanes. Sebastian Aho, Williams and Andrei Svechnikov also have scored at least 20 for Carolina; Nino Niederreiter has 22 goals this season but came to the Hurricanes in a trade in January. … Talbot saw his first action since a March 6 relief outing. … Carolina is 23-1-3 this season when leading after the first period. Flyers: Return home to meet the New York Rangers on Sunday. Hurricanes: Visit Pittsburgh on Sunday and will play three of their final four regular-season games on the road.